one of the best rides there. it will suprise u wen it flips u over. This could be an awesome ride. It's intense and smooth throughout. The ride itself is actually one of the better rides I've been on. All the fly-to-lie elements are great, and the helix at the end is intense. My favorite part of the ride is definitely the vertical loop. 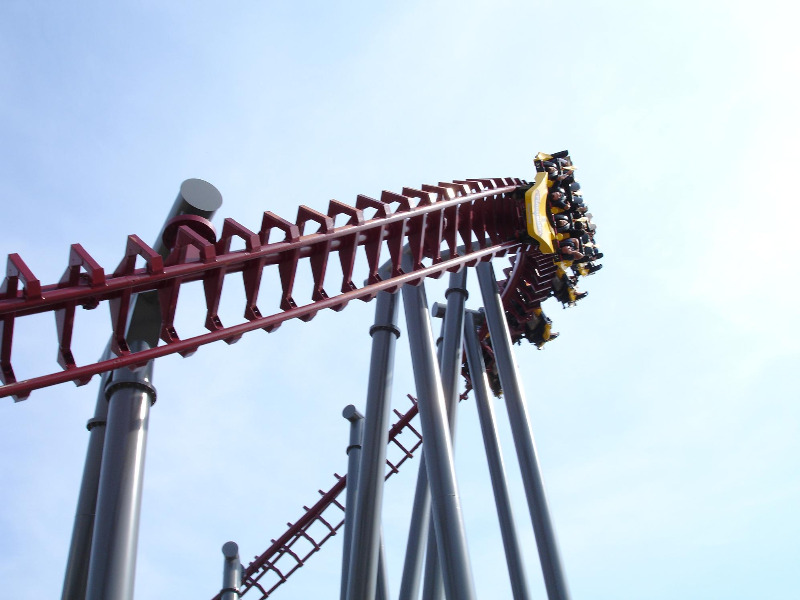 There's just something unique about positive g's on a flying/li-down coaster. They're more intense than normal rides. The ride experience on Firehawk is great. Unfortunately, the wait is horrible. When I went to King's Island, the park was literally empty. The line for Firehawk was pretty much empty too. But, what looked to be maybe a 10 minute wait turned out to be over a half hour. It took each train about 5 minutes to get out of the station. Looking at the overall design, I wonder if it would be batter to have a single station and have the second train wait on the brake run. I know these kinds of coasters can operate a lot better. Superman Ultimate Flight at Six Flags Great America went a lot faster. The only reason it's line was long, is because there were so many people waiting for it. EDIT: I found the trick to beating the exxtremely long lines! You have to get to the park right when it opens, and ride Firehawk first thing. Most of the morning crowd heads straight toward the brand-new Diamondback, leaving the rest of the park relatively empty. If you can get to Firehawk right away, the line won't even be out of the station, so it's a very short wait. One of the most unique experiences at the park. Although it&#39.s a Vekoma, it was quite smooth, and the sensation of going up the hill on your back was something I had not experienced anywhere save for X, which has a similar feel in that respect. Although it is fairly short, I found the ride to be surprisingly forceful and the lie-to-fly elements were cool and provided for a more varied experience than on SUF. I still enjoy Superman more, but this was a surprisingly good ride at KI...probably the best in the park. Good flyer in my opinion. This one was very smooth throughout. The first drop was decent and really built up speed and the following turns gave a good sense of speed. Following that was an intense vertical loop with killer Gs and then a turn leading into a great double barrel roll, which gave good Gs and it was pretty disorienting. Afterwards was an intense helix with strong Gs and then it hit the brakes. The ride was on the short side though, but it was very smooth throughout. This is one of those rare coasters that actually can scare me, and thats a good thing. Such a bizarre feeling you have in those seats, as they lay you on your back. I felt like I was at the dentist and Im sure some women feel they are somewhere unpleasant. But it passes. You go up the hill laying back, and then swing over like a hanging baby starting at the first drop. Weird, weird feeling hanging there but it made for a true thrill ride experience. I will be riding it again. The first ride of my recent day at PKI ended up being the best. Firehawk completed the Flying Dutchman trifecta for me, and Id say it was probably the best. I hated Batwing and didnt mind Borg, but wheras I found the other two very uncomfortable and, in the case of Batwing, rough, Firehawk didnt really give me problems with either. The layout is fun, much better than the Superman flyers, and the ride has some great transitions back and forth between lying and flying. If only it didnt have the "lie" lifthill, and it was more reliable and quicker to operate, I would wish that more were built, and it may be my favorite flyer... but I think Tatsu still wins out, and I slightly prefer the SUFs as well.